Welsh national boxing coach Colin Jones says Fred Evans will compete at the 2014 Commonwealth Games despite his conviction for assault. The 2012 Olympic silver medallist was fined £435 after he admitted assaulting a customer at a Birmingham lap-dancing club. Evans will be disciplined by GB boxing but is expected to escape with a warning. "He is going to be part of the Commonwealth team," Jones said. "Let's hope it doesn't have any affect on his performances. "I think that's something [for the] Great Britain team, who Fred boxes for, and the programme that he is part of. "They will deal with it as they see appropriate, but it doesn't in any way interfere with him boxing for Wales." Evans, 23, admitted assaulting a customer at a Birmingham lap-dancing club after a row over reality TV show The Valleys. 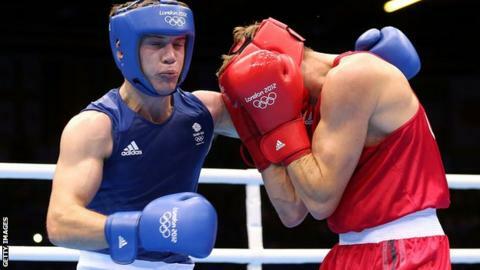 The Cardiff-born Evans won an Olympic silver medal when he lost to Kazakh boxer Serik Sapiyev in the welterweight final at London 2012. Evans's success gave Wales its best boxing medal in the history of the games, trumping Ralph Evans's bronze in 1972 Munich Games. Evans has been expected to miss Glasgow 2014 because of his commitments with the International Boxing Association's new Pro Boxing competition. But Evans and fellow Welshman Andrew Selby will be available to represent Wales at this summer's Games as the start of the Pro Boxing event has been delayed until October.